The famous hill which is visible from many parts of Hampi is the Anjanadri hill. It is easy to spot with the white stairs spiralling around the hill. 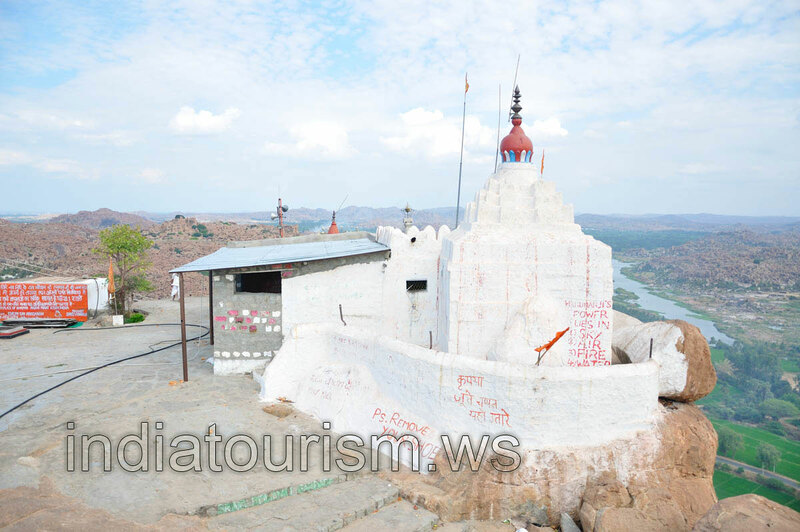 There are two ways to reach the hill, take a ferry from the Virupaksha temple and reach this side or take the highways, pass the Tungabhadra dam and follow the route to Kishkinda resort. Both ways will open before your eyes the beautiful scenic view with lush paddy fields on either side of the road bordered with boulders. I would recommend to go to the Monkey temple just to see the beauty of fields with some monkeys jumping around. The stairway to the temple has more than 500 steps to climb. And there are monkeys climbing along with you. But these are good monkeys, unless it is a banana or coconut in your hand they do not harm you. As you climb up, the steps get steeper. We stopped here and there, enjoyed the view of Tungabhadra river flowing through Hampi. On the top of hill you will find the small temple. The view from the hill is beautiful. Distant paddy fields, river, coconut groves and boulders! We spent some time feeling the breeze and climbed down.